Okay, you get the idea. Bee Not Afraid is somewhat of an ironic title – because I am. So, for now, I’m leaving the bee feeding up to Big Hal. A few years ago when I was nursing babies, I decided that all potentially harmful or life threatening tasks (like tasting the chicken salad to see if it’s still good or dealing with thousands of angry stinging bees) should default to Big Hal. That might seem harsh, but did I mention that I was pregnant and/or nursing for over 10 years and two of the babies were 10 pounds? So, I think I’ve earned a free pass. Anyway, He wears protective gear – not a real bee suit, but some sort of turkey hunting garb he has that includes a veil. If the hive (and Hal) survive through the winter, we will invest in a bee keeper’s suit this spring. Most of the real bee keeping is actually being taken care of by a friend of ours who has years of experience. We hope to learn a lot from him and be able to tend to them all by ourselves someday. We also hope to have a honey by fall. I’m already planning a honey themed harvesting party! 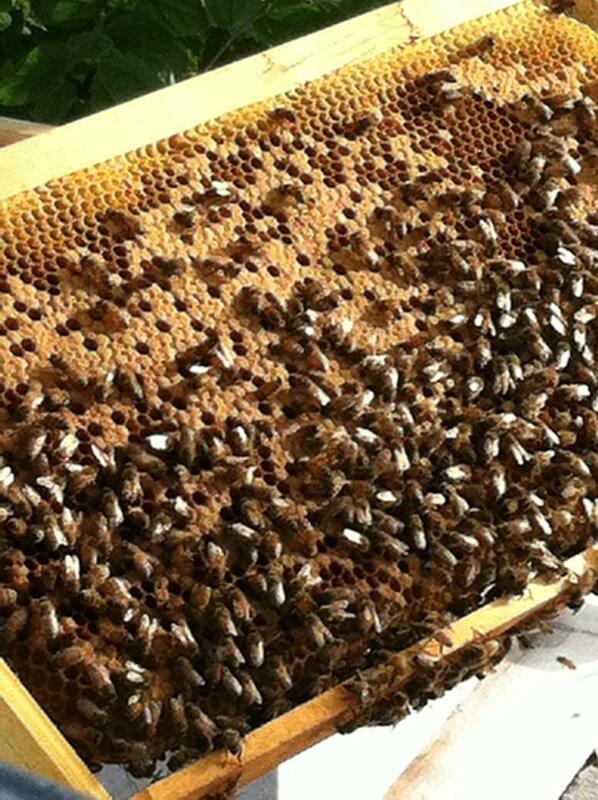 In the meantime, we are already seeing positive results from having bees on the farm. A peach tree which has never yielded fruit, did this year. With the bee population on the decline, I hope that our bee keeping will contribute positively to the local environment, and I hope to see more people raising their own hives in the future. My father says that when he was growing up, everyone had a hive or two. As a bee keeping newbie, I don’t have any advice to offer, but I do want to share some links. It might seem strange for a big scaredy cat like me to be encouraging others to raise bees, but keep in mind my fears are mostly irrational and stem from a wasp in my hair incident in 2nd grade. Yes, my bees scare me, but I will overcome my fear, and learn to feed the bees myself – someday. Perhaps some of you other farmers and farmer wannabees, might like to give bee keeping a try too! Thanks. I’m excited about beed keeping, but happy my husband is willing to be the head keeper for now. The man who got us started in bees, and who has been raising them for years, only got one quart of honey last year. This year he has already gotten over 20 gallons. It’s a good year for bees! It will probably be next year before we get honey, but when it happens, I will definitely post pictures of the party. This is reblogged from my former blog. Big Hal checked the bees today, and they’re doing great!